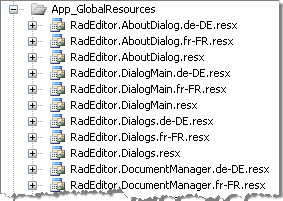 Each dialog, module or a context-menu has its own localization resource file located in the App_GlobalResources folder. The best way to create a new language is to duplicate an existing set of resource files and modify them. 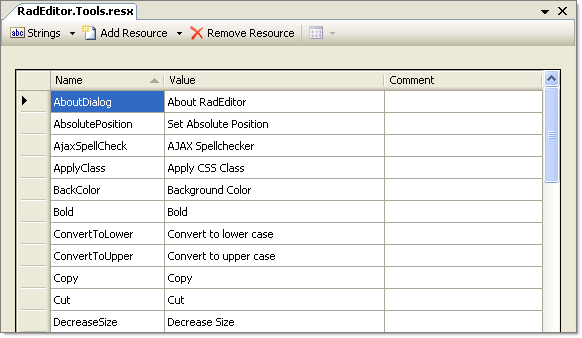 For example to create a new Italian resource file for Tools, you can copy the default RadEditor.Tools.resx to RadEditor.Tools.it-IT.resx. The culture name has to follow the RFC 1766 standard in the format [Language Code]-[County/Region Code]. In our example, it-IT stands for Italian - Italy. Then open the resource file in Visual Studio and change the Value column entries to their Italian counterparts.